Last week while driving home from vacation my family and I stopped for lunch. I tried using the spork they gave me to eat some yogurt my wife packed in our cooler, but that didn’t really work. Then I tried using it to stab some cut peaches, which was even more frustrating because the tiny little prongs hardly penetrated the peach far enough to hold on to it. 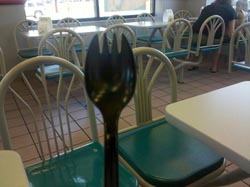 My spork is a lot like ministry. If you try to be too many things, you end up doing them all poorly. Know what your ministry is about, focus on that, do it well, and refuse to be distracted by trying to do too many other things. That’s when your ministry will become diluted and mediocre. Remember the power of focus and identity.